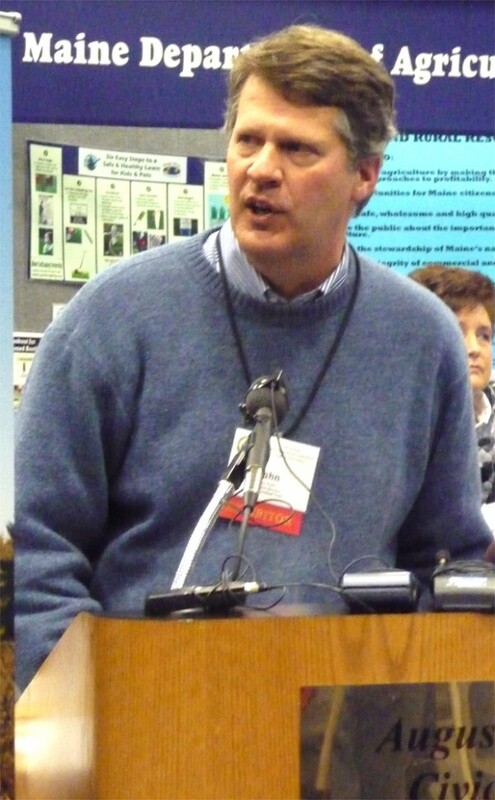 John Piotti, executive director of the Maine Farmland Trust. BELFAST, Maine — MaineFare, a celebration of the state’s local food, farms and eateries returns Friday, Sept. 7. Hosted by the nonprofit Maine Farmland Trust, the festival includes a farmers market, a gourmet lunch, film screenings, panel discussions on food and farming and various opportunities to eat locally grown and prepared food. MaineFare will be held at various locations in downtown Belfast from 9 a.m. through the evening. A local food midway near the intersection of Main and High streets, which will be closed for event, will feature over 50 vendors under tents offering local vegetables, meats, cheeses and prepared foods. A noon “Farm to Table” lunch will be served under a tent on High Street near the intersection with Pendleton Lane (near the Belfast Co-op). The four-course lunch begins with melon gazpacho and crostini with melon butter and lardons of local ham. The second course includes a salad of roasted golden beets, triticale, hearty greens, local cheeses and a lemon tarragon vinaigrette. The main course will be a deconstructed lobster roll with lemon chervil aioli and kohlrabi slaw. To finish the meal, a goat cheese panna cotta with fresh berries and mint. The meal will be prepared by Ladleah Dunn, the proprietor of Sailor’s Rest Farm in Lincolnville and accomplished professional chef. John Piotti, executive director of Maine Farmland Trust will deliver opening remarks at 1:30 p.m. at the Colonial Theatre on High Street on the topic, “Feeding Maine.” A panel discussion will follow. At 3:30 p.m. the documentary film “ Truck Farm” will be shown, followed by another panel discussion. Cookies and fresh milk from Maine’s Own Organic — or “MOO Milk” — will be served during the afternoon program. MaineFare wraps up with “local plates,” with several downtown restaurants offering farm-to-table fare. Restaurants participating include: The Lost Kitchen, Chase’s Daily, Darby’s, Delvino’s, Rolllie’s and Front Street Pub. Each will feature one appetizer and one entrée comprised entirely of local ingredients, referred to as their “Maine Fare Local Plate.” Participants are encouraged to make reservations in advance. MaineFare coincides with Belfast’s Friday Arts Walk that evening. Tickets to the panel discussions and film are $15. For those wishing to attend lunch, the total price is $30. Tickets can be purchased at maine-fare.com or by calling the MFT office at 338-6575. Tickets also can be purchased the day of the event, although hopeful attendees are discouraged from waiting, as there is limited space available for both the lunch and film screening.